Maritime Rowing Club’s High School Program has become a nationally recognized program, for its development of world-class rowers. 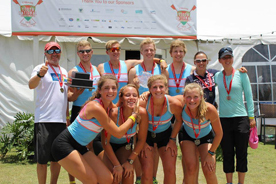 MRC rowers have participated in the US Rowing Youth National regatta, winning medals at all levels. Several MRC rowers have gone on to win medals at the world championship level, for the US National Team and the US Olympic team. At the same time, Maritime Rowing Club recognizes that not all rowers will become world champions, and the philosophy behind the program is to help each athlete develop his or her potential, and to develop good rowing skills and team fundamentals. High school rowers participate in competitive regattas during the Fall and Spring seasons; during Winter Training they work out indoors at the Maritime fitness facility and indoor rowing tanks in Norwalk, CT. The summer program reinforces skills learned during the year, and introduces new rowers to the program. Summer rowers participate in the USRowing Club National Championships and the Philadelphia Youth Regatta. A pre-season week is also available to middle and high school rowers the last week in August, in preparation for the Fall season. At the beginning of each season, coaches will evaluate athletes and place them into appropriate team. Rowers come from high schools across Fairfield County.